The last 2 or three e3’s have been more or less disappointing. But at long last, this year was different! The first conference I saw was Ubisoft, and they had lots of exciting announcements, most notable the Mario/Rabids crossover known as Mario+Rabbids: Kingdom Battle, which looks awesome, and the completely unique game Skull & Bones. Fans of the Assassin’s Creed series will be excited for the new Egypt based game. See it all here. Next up was Sony. There conference was great because there was hardly any talking and they just played trailer after trailer, which makes me wish they just made a video like Nintendo to keep the flow going better. But anyway, they basically showed the same games they showed at last years e3, but with much longer trailers/gameplay. 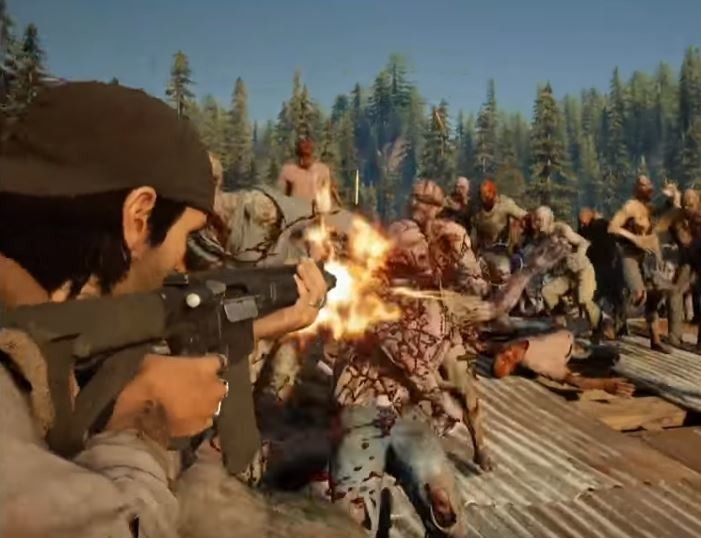 And this was fine with me, for they showcased a lot of great looking games, most notable for me was Days Gone and the PS4 exclusive Spider-Man. I can’t wait to play those two games! Check it all out here. But the most amazing part about e3 by far was Nintendo’s “Spotlight” video presentation. Anyone who said the Switch doesn’t have a lot of software has now been proven wrong. They announced a whole slew of new titles for both this year and next, guaranteeing two years of great games. Yoshi, Kirby, Metroid, Mario will all be making appearances, to name a few. You can check out everything in detail here. 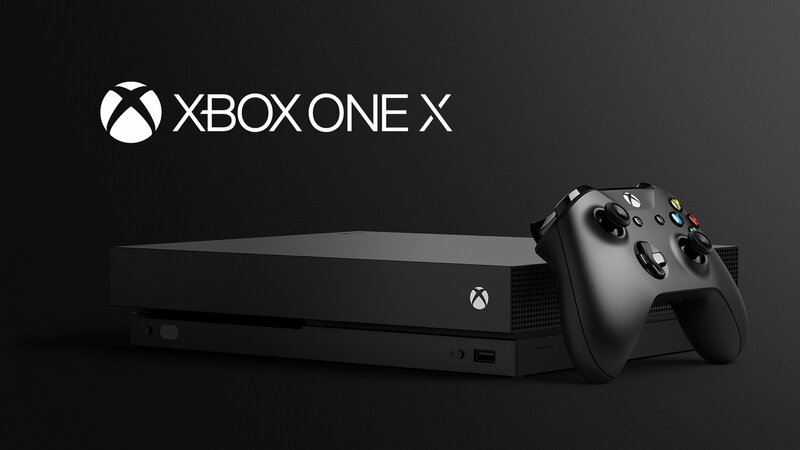 They are the only ones I saw in detail, but Microsoft revealed a few new games and the brand spanking new, powerful consoles Xbox One X. You can watch the conference here. It was a great showcase, and I am very excited to be a gamer right now. Final Fantasy VI: One of the Greatest Games of All Time? Continuing on with my marathon of Final Fantasy, I have just beaten number 6 and thought it also worthy to comment on. For most of my life, I have heard that this is one of the best games of all time, and most people claim this one or Final Fantasy VII as the best in the series. 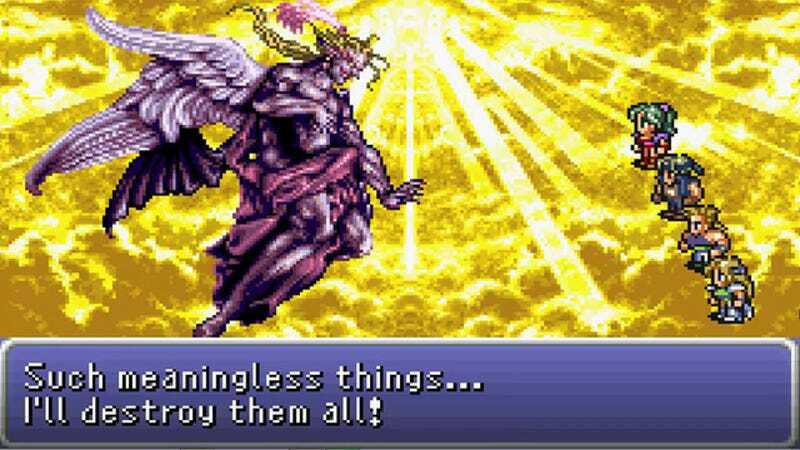 Sure enough, if you look at best games of all time lists, FFVI will likely be at least in the top 20, and for best SNES game lists (as Final Fantasy 3), it will be in the top 5, if not the top 3. So, you would think I would go into this game with incredibly high expectations. But don’t worry, I treated this like most any movie or game I play…meaning I went in with no expectations…well if anything, they were probably a little low judging by what I think of all the games prior. What I found was that I was right in not expecting much. The game is mediocre, like the rest of them, and I certainly wouldn’t put it anywhere near “best games of anything.” And yeah, VII is way better. And VII isn’t even my favorite. But that is not to say that this game was bad though. It was just okay. First let me mention what the game does well. All the games prior to this one followed a basic format. Walk around on the world map, go to towns, then to some dungeon or cave or castle, fight stuff and kill something or find something, rinse and repeat. While this game does that as well, it doesn’t feel like it. All the environments are very varied and fun to traverse through. The environments just look great and don’t give the game a boring, repetitive feel like some of the others did. In terms of scenery and setting, yes this game is by far the best out of the first 6 games. They also relaxed a bit on random encounters, making it bearable to walk around in this game. This is a huge plus for me. And what’s more, they even let up on the unbelievably annoying, and seemingly constant status effects. So, in other words, the gameplay is the best I’ve seen so far as well, well except for maybe FF4. Honestly, through most of the game, it is pretty fun and a solid game overall. I like how the story dictated what characters you could use about half of the time, instead of just picking four of the 14 possible characters and just using them throughout the entire game like a lot of RPG’s do. The story itself started out interesting, but then it just kind of stopped halfway through the game and turned out to be not so great. I like how every character could learn any spell by equipping the summons. That was a nice touch. The best addition to this game is the fact that you keep all your experience if you die. You will start at the last time you saved like all the other games, but this time you kept all that hard earned experience, making it easier to ensure you aren’t always underleveled. So yeah, not a terrible game. But here is what kind of ruined it for me. Instead of having annoying status effects all the time, this game loved putting in enemies that would counterattack after you killed them. This became quite annoying, as these counters were generally very strong. There is even one part where you only have one character in your party, and when you kill a certain enemy, it countered by casting a spell that turns you into stone. In other words, that’s an instant game over. That is just cheap and/or horrible game design! You shouldn’t be able to find yourself in that kind of situation! 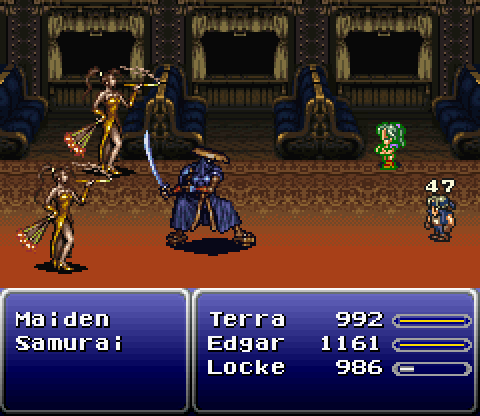 And towards the end of the game there are enemies that when killed, instantly kill one of your party members. Why? You just wind up running from them, because you typically fight two of them along with another enemy. It is not worth using the items or magic it cost to revive two characters that are guaranteed to die. This should not be in the game. It doesn’t bring any challenge to the game, it is just an annoying, cheap, unfair way of inconveniencing the player. But you can’t have a Final Fantasy game without those factors involved, it seems! And speaking of death after battle, there is a spell that puts a timer on one of your characters, usually about 30 seconds. When it drops to 0, that person is dead. But you would think that when you defeated all the enemies in that battle that the counter would stop. But no, it doesn’t. After killing the enemies, the amount of gold, experience and any items you get all show up one at a time, and that counter is still going, so if you take too long to read your rewards or if the counter is very low at the end of the battle, you can count on having to revive the character after the battle. Another issue with this game is the frame rate during battles. It just randomly slows down badly, often messing up my timing and so many times I’ve used the wrong attack or targeted the wrong thing because the game was too busy sucking to register my button inputs. But all that is tolerable. What really killed me was the end of the game. As a child, in every RPG, I would switch out all the characters and level them all equally, only to find that towards the end, I was horribly underleveled and had to grind four characters to make them adequate enough to beat the game. So after falling into this trap a whole lot of times, I learned to just pick four characters from the get go, and things got a whole lot easier. It turns out, for FF6, I would have been better off playing this game as a child. For the last area of the game, without any warning or chance to back out and prepare, you have to choose 12 of the 14 characters and split them up into three groups. Most of the characters were within 5 levels of each other thanks to the story having you always using different characters, but most of the time I used the same 4, who were much, much, much stronger than the rest. So now I had to divide them up to carry my weaker members. But I didn’t know this was going to happen, so everyone had crappy gear, didn’t know many useful spells, and were slightly underleveled. I also never got a chance to buy a bunch of items to keep me alive. So what did I have to do? I had to unequip all the characters I wasn’t using and equip the group I was using with the best possible stuff I had. Thank goodness I never sold any equipment, for some members were stuck with old crappy weapons, but this was better than having none at all. To make matters worse, the strength of your enemies seemed to have tripled. These fights would have been easy with my A-Team, but now they were downright difficult. The game doesn’t give you enough magic points to use any offensive spells, you had to save it all for healing, and I barely had enough to do that. My saving grace throughout the whole game were 3 items that allowed you to equip two weapons and double attack on each round. So yeah, I beat the entire game more or less just using physical attacks. It was cool. But anyway, after dying a bunch of times, they eventually all grew a few levels thanks to keeping your XP when you die. Once I finally reached the end of one section, I had to unequip all my weapons, armor, relics and summons, so that they would be available for the next group, then painstakingly equip it all on them. So I just kept moving on, fighting a bunch of bosses with my three underleveled/undergeared groups and somehow managed to eventually beat it. I progressed through the game fairly quickly and easily, but I was in the last area for around 4 hours before I conquered it. The worst part is there is a long boring scene before the last boss that you can’t skip. The first time I fought him, I didn’t know what I was doing, because all your characters might have to fight him, so I ended up fighting him with all completely unequipped characters and died immediately. Then I had to watch the long boring scene again, and lose to the boss again. After the second failure, I understood what was going on, and after once again watching the long boring scene, I went all out and beat him. By the end of it, I was sick of the game. But they had one more great surprise for me at the end. A long…oh my God, how long…boring…seemingly never ending scene. I kid you not, between the ending and the credits, its over 20 minutes long. The credits are terrible even! Instead of the traditional scrolling text, they opted to just show an airship floating around through clouds while occasionally showing a name or two at time. I mean, it is so uninteresting AND SO F-ING LONGGGGG! And the game suddenly becomes obsessed with this woman you never even see in the game having a baby. Like towards the end, you go into this town you’ve been to a couple times before, and she’s all the people can talk about all of a sudden. Who is she and why should I care? She isn’t important to the story. She doesn’t do anything useful at all. And then when you beat the game, like 3 minutes of the ending scene is dedicated to this woman. Who is she? Is it just supposed to be some weird happy ending, symbolizing that things live on and grow in the aftermath of chaos? It’s just stupid. So the game is pretty good until the last dungeon. That is the point I am trying to make I suppose.